Not all Bullfighters get their facepaint put on by girls…just the ones with game! 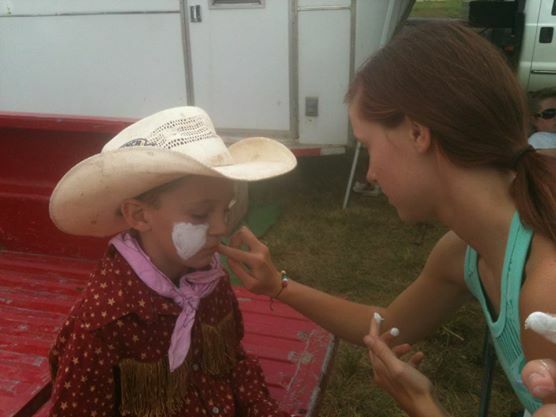 On a rodeo weekend it is not uncommon for me to take a little while to do my make up. Recently, I added blue, because that is what William Wallace did. Now it takes forever…it’s a reversal of commonly-sterotyped roles. She is waiting patiently for me to finish putting on my make-up from my One Direction bag. Should the baby powder smudge my face paint…might as well cancel the dinner plans. I put on face paint for fun, where as others have put it on for much more serious purposes. Face paint was utililized as far back as the Neanderthal civilizations as camoflage for hunting and in battle. The Neanderthals invented it, but William Wallace made it famous. It is pretty obvious God had His face paint on in the book of Exodus. The self-disclosure of God ends with the punishing of the guilty, something which most everyone can agree with and by doing so will embrace “God is just” (2 Thes. 1.6)…but that is about as far as most feel comfortable to go. The theme of Divine Warrior, especially as portrayed in the prophets, but founded in Exodus, is a motif that reveals a side of God that doesn’t fit nicely into preconceived notions of a loving and compassionate deity. The Lord is certainly a warrior (Exodus 15.3), to quote Moses and the Israelites. He even has a book about His battles: the Book of the Wars of the Lord (Num. 21.14). He gained the reputation with the way He dispatched of the best of the most powerful army on Earth. All of chariots of the war machine of Egypt, destroyed with the power of the The Warrior Lord’s right hand and the breath of His nostrils. (Exodus 15.6-8) The people honored Him with song; the Israelite version of “the Wabash Cannon Ball”; “Roll Tide” or “Rocky Top”. Before the Battle at the Sea, there was an arm wrestling match between the Lord and Pharaoh that ended with a striking of Biblical proportions. God struck down the firstborn of all those without the blood on their door frames on the Night of the Passover. The word for struck, nagap, is used 49 times in the Old Testament. Only 16 times is the word used to denote a plague or attack on a single person. Every other time it is a word for battle, the defeat of an enemy. The Passover was not just a plague, but the routing of an enemy. After the Battle at the Sea, as Israel marched toward Sinai, the Amalekites attacked the rear of the Israelite parade. (Exodus 17.8ff) Moses chose Joshua to take the best men into battle. He stood above on a hill, raising his staff (God and Moses’ finishing move), and helped the army of Israel defeat the Amalekites. As mentioned earlier, when God beat Egypt at the Red Sea, Israel responded in song. In this instance, Moses responded by building an altar. The pile of stones he named: “The Lord is my Banner”. Jehovah Nissi. The banner is mostly used in Scripture as a military sign. Jeremiah would tell the people to fly a banner to proclaim the ultimate demise of Babylon (Jeremiah 50.2) and in the Psalms, the people were to declare victory and the triumph of the God by setting up banners in the “name of God”. (Ps 20.5) The Lord is my Banner, is a declaration of the triumph of the Divine Warrior. Though the Amalekites weren’t completely destroyed by Joshua, they would be pursued by the Divine warrior from generation to generation (Ex. 17.16) until David destroys them in 1 Samuel 30. God, as the Divine Warrior, was key to the understanding of the people, especially as they were forming and coming together as an infant nation. But the theme is just as central to our understanding of the Lord. God is not a passive, unresponsive God who delights in seeing us toil. He wants to lead us, to fight for us. It was He who sent His son to defeat Satan and death. It was He who sent His Spirit to give us power as we face obstacles and opposition. The Divine Warrior, who will someday come and win the Final Battle spoken of in Revelation, is fighting for us right now. I don’t know what God’s face paint pattern would be…but I know that He has His on and is ready to fight for His people when and wherever. I didn’t wake up this morning expecting the world to be turned upside down but now I’m looking up at the floor and walking on the knock-down-textured-ceiling…and all because of a little brown bottle. For my birthday, Ethan Schultz bought me a 6 pack of rootbeer from Mass Street Soda in Lawrence. It contained my two favorite root beers (Henry Wienhards and Buckin’ Rootbeer) out of the now 42 different kinds that I have tried. I love a good story, a good thought, and a good root beer. But nestled next to a couple favorites was a new kind, fresh press, a unknown entity…Barrel Brother’s Root Beer. 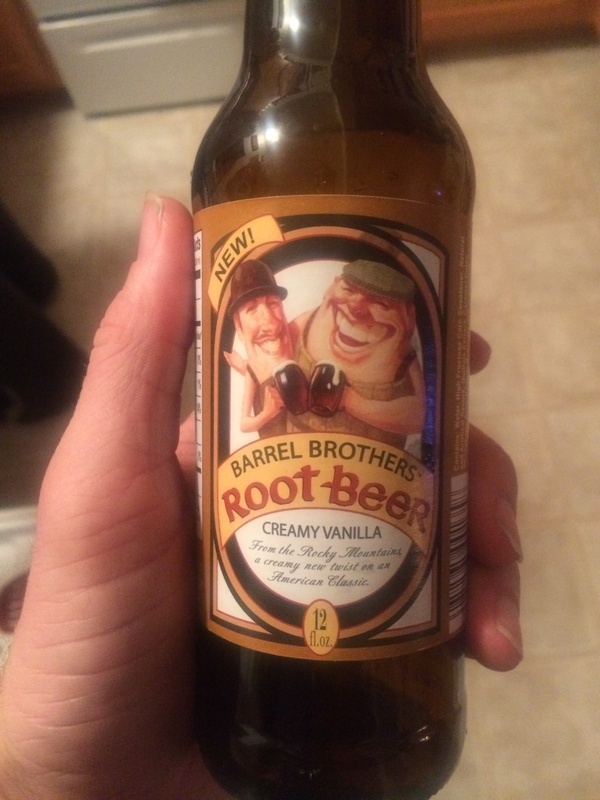 The good brewers at Apple Beer have made a root beer with strong vanilla taste with a hint of Marshmallow. Though it did not displace my top two, it slid firmly into third place, displacing Bulldog. For many of you, this is the most you have read about root beer, but I consider it my mission to help educate you on the finer points of the legal side of the Prohibition.